I don’t read a lot of YA, mostly because I find romance *icky*. (I have the heart and soul of an eight-year-old.) Sure a hint of romance might be ok, but anything more than a quick peck after a long courtship and I’m hiding behind my fingers whispering ewwww! BUT, I made an exception for Derek Landy. I loved the Skulduggery Pleasant Series so much, so when his new book Demon Road came out, I HAD TO HAVE IT. And then I couldn’t read it because I was finishing my own draft of the second Alice Jones Mystery. What I love about this book is that you jump in and hit the ground running. The first line sets the pace (seriously, go check it out) and things don’t slow down. 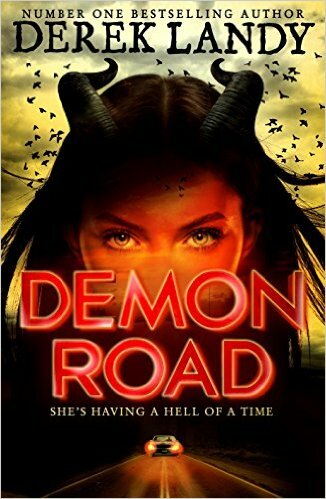 Amber is on a supernatural road trip and every stop on the Demon Road, we get to deal with another villain from our worst nightmares. It’s such a clever set up, because it means the plot gets to have vampires, wicker-witches, demons AND a serial killer or two without feeling crowded. Besides the sheer joy Landy obviously takes in writing scares, he’s also crafted a real and likable cast of characters. I love Amber, and how she has to deal with her inner demons (literally). A girl after my own heart, Amber has no time for blossoming romance while on the run for her life. Her response to an attempted kiss is priceless. I’m going to cut this short before I squee all over the page. I recommend this book if you like genuine scary stories. There is blood, gore and major peril. Read at your own risk.